Are you confused as to what TRULY makes a product organic? Do you question the integrity of some brands when they claim their products are organic? How important is it to you that products are organic and WHAT is the difference? Does it REALLY matter? We all know safer personal care products cost more. Why not put that extra money towards products that you can be SURE are indeed safe? When it comes to organic, we know our stuff! We've been through the process of becoming certified USDA organic and trust us when we say, "that process NEVER ends". Just because a company "claims" it is using organic ingredients does not mean it is. I want to be honest- some companies know they are NOT using organic ingredients, but the majority just don't know what the difference really is. The difference between a true certified USDA organic product and one that is not is that the companies that ARE certified KNOW THE RULES. The rules are pretty complex- matter of fact, there is a HUGE book of those rules that all USDA organic companies receive every year. Think of it like our bible. We need to know it from cover to cover and make sure we are following each and every one. There is no question about the label and ingredients matching, nor is there a need to hire 3rd-party labs to conduct testing on those products that maintain their seal! What does it take for us to become certified? First, we needed to fill out what seemed like an eternity of surveys/questionnaires. The questions were extremely detailed down to the most minute piece of information. We were asked about our water supply, how we clean & sanitize work stations, how we clean & sanitize our equipment. Meticulous records needed to be maintained from start to finish of ANY product being manufactured. (If a facility has pests, only certain pesticides may be used. Luckily, we have not had that issue.) Back to keeping records, for instance, a record of each ingredient we use is kept. When we order an ingredient, it goes in our record. We need to list who the supplier is (and of course they must already be certified as acceptable to use by the USDA certifying company. In our case, it is Baystate Organic Certifiers). We need to track what date the product was ordered and when it was received, who received it, the lot # and where the ingredient was stored. Another record we keep is our manufacturing record. On it, we list what product we are making, the date it is being made, who is making it, ALL the ingredients AND units of measurements for those ingredients, all lot numbers associated with the ingredients and how many products were yielded. Then our products are assigned lot numbers. 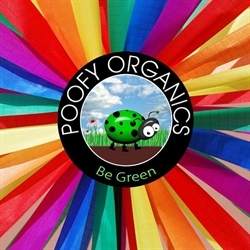 It is quite a process for every time a product is made, especially because Poofy Organics has over 100 organic products. it can become quite hectic! Another record that is kept is the cleaning/sanitizing record. Every time a product is manufactured, we must document how we cleaned & prepared the equipment and how it was purged. Lastly, we have a cleaning/sanitizing record for our facility. This includes when and how we clean our floors, etc. Anytime a new product is created, we have to send an OPP- Organic Product Profile to our certifying company. On it, we need to list all the ingredients, the supplier and the concentration of those ingredients. Any non-organic ingredient that is allowed in the organic product (and those are very few and minute percentages), needs to go through another process which maintains that the ingredient has not been manufactured using sewage sludge or ionizing radiation and has not been created using GMOs (genetically modified organisms). An example of such an ingredient would be baking soda. Because baking soda cannot be found organically, a company like Bob’s Red Mill is a staple for organic companies. It upholds the highest standards in the industry. A new product considered for certification also needs to go through a rigorous “label” certification. Even the labels have standards and rules. Each label is sent to the certificating agency to make sure it is in compliance with those rules. We are inspected annually. Each year a new application for certification needs to be completed- some of the information is stored so it makes things a bit easier. During inspections, records are sifted through to make sure all ingredients, products, manufacturing, labels and cleaning/sanitizing is in compliance. Batches are randomly picked to make sure the ingredients and numbers add up to the number of units sold. It is quite a heavy-duty process. It is often misunderstood that once a company is certified, the job is over. It is a CONSTANT process- always keeping records, always turning in new documents. What about the products that are NOT certified organic in the POOFY line? Aren't those just the same like all the other companies? How do we separate ourselves from the others? There are NO differences in the standards for FOOD to be certified USDA organic and personal care products. That means that if an ingredient is not allowed in a food, it is not allowed in a certified organic product. Because some products REQUIRE specific ingredients to be made, and we need to use those ingredients, we have some products that are not certified. So, how does that separate us from the others? Here's the difference. Besides the ingredients in our nail polishes, We ONLY use FOUR types of ingredients that are not allowable in food, and thus not allowed in a certified product. 1) Zinc Oxide- zinc oxide is a mineral used to make our sunscreen and most mineral-based sunscreens. It is the ingredient that actually turns a regular lotion INTO a Sunscreen. If you don't know why you should be using a mineral-based sunscreen, be sure to read our SUNSCREEN blog post. NO SUNSCREEN can be USDA Certified Organic because of the necessity to use an ingredient like zinc oxide. You can use ingredients that are organic, like we do, but the product itself is not considered "organic". 2) Decyl Polyglucose- An effective & gentle cleaner with no reported adverse affects and TOTALLY biodegradable. NSF allows it in their organic products because unlike the USDA, their standards are for personal care products. Unlike other surfactants, Decyl Polyglucose is manufactured from renewable vegetation and is earth friendly. It is derived from corn, glucose & starch. Corn supplies the carbohydrates which are converted with fatty alcohols from native oils such as coconut or palm. We make sure ours comes from gmo-free corn. You don't want inexpensive synthetic agents that make up the base of most liquid soaps and shampoos. They are harsh on the hair & skin. They delete natural fats and phospholipids from the epidermis that weakens the skin allowing toxins and bacteria to invade. Many of them have been invented, creating a huge and very profitable industry. Only after the industry flourished, flooding the market with many varieties of creating a vast environmental problem, did the government of many countries in the 1960's ban the most harmful ones. No long-term effects of these surfactants were studied on the human skin. The first surfactants were so cruel to skin that people using them every day developed eczema and dermatitis. The medical profession finally spoke up and the most damaging ones were taken off the market. That was possibly the largest unauthorized test on an innocent public that has ever occurred. When most people claim they have "sensitive" skin, they truly do not. They are reacting to chemicals which were never meant to be on the skin in the first place. Your body is trying to tell you something! Listen! 3) Waxes that cannot be certified: Emulsifying Wax- this ingredient can be complicated. It is used to make lotion products. it takes the water and the oils/butters and emulsifies them together. Think about how oil does not blend well with water. Well, this changes that characteristic. There are SO many different varieties out there and with no regulation, you never know what you're going to get in your products. It usually consists of 2-5 ingredients- some of them scary. Thankfully, we use the purest and simplest one out there. It is comprised of cetyl alcohol & sorbitan ester. Both benign ingredients and it doesn't take much in the recipe. Coconut Wax (in our candles) goes through a process that prevents it from being certified organic. Micas/Iron Oxides- These are used as colorants in our makeup and some soap. Soda Ash- Also known as Sodium Carbonate or Washing Soda, this ingredient is used for cleaning processes. Activated Charcoal- used in our facial soap to help to balance and restore. So, those are the ingredients that cannot be certified that we use in our products. EVERY OTHER INGREDIENT has been certified. How is that different from other companies? Most companies nowadays are taking a FEW "organic" ingredients and sticking them smack in the middle of CHEMICALS. 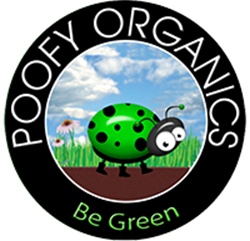 What makes Poofy different from your typical company trying to use organic ingredients with conventional ingredients is that we still uphold the strictest standards in those products. What is the point of organic ingredients if they are mixed with chemicals and questionable ingredients? There is no point and completely defeats the purpose of using organic ingredients. That's like purchasing organic spinach to eat and then spraying it with pesticides. And, there is NO point in spending the extra bucks if you're not getting TRULY organic. What percentage of ingredients have to be organic for you to get the seal? In order to place the USDA organic seal on a product, it has to be AT LEAST 95% organic. Then, there is a MADE WITH ORGANIC statement that can be used with products who are at least 70% organic. Anything less than 95% cannot use the SEAL and instead need to use the "statement".